A Jaguar E-Type Roadster restoration to better than new condition with the addition of some subtle improvements to make it more useable. The classic looks have been maintained yet underneath there are many changes. The classic car market has reached a new peak thanks to an Aston Martin DB5 Convertible. The booming high end classic market continues to climb with Ferraris very much taking the lead but Aston Martins are now catching up. Jaguar Land Rover are clearly keen to reinforce their status as a high end manufacturer with the announcements of Special Vehicle Operations and a relaunched Heritage division. The RM Auctions sale at the Monterey Car Week festival each year is nearly as well known as the nearby Pebble Beach Concours d’Elegance. Of the stunning classics to go under the hammer this year we picked out three interesting convertibles. With classic Aston Martins fetching prices steadily heading into the stratosphere getting behind the wheel of something like a DB5 is becoming restricted to the privileged few. One alternative now comes in a miniature size. Mecum’s Chicago auction will be offering a unique classic Corvette which was the personal car of one of the most influential car designers in history. Harley Earl is one of the great icons of the car industry and perhaps the most influential person in American car design. He had a ground-breaking ability to understand the power of aspirational car design. The Coys Blenheim Palace Auction of historic collectors cars is an annual event in the UK with a catalogue of beautiful machinery expected to fetch often eye watering prices. 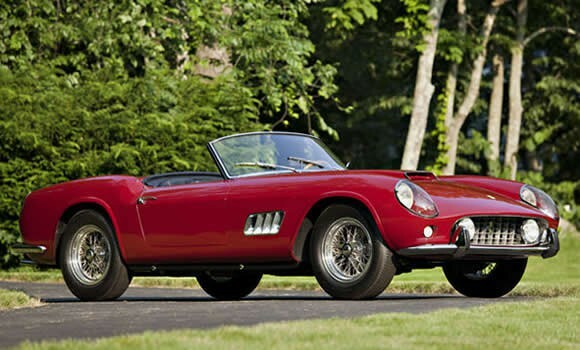 Among this year’s selection are two iconic celebrity owned convertible cars which jumped out of the lot list. The Monterey Car Week is a Mecca for exotic and classic car enthusiasts from around the world. The world’s finest cars are on show at events around the California peninsula including the Rolex Monterey Motorsports Reunion, Pacific Grove Concours Auto Rally and the famed Pebble Beach Concours d’Elegance.